Wi-Spy DBx is the flagship hardware product of the Wi-Spy lineup, and MetaGeek?s most versatile and powerful spectrum analyzer tool. Compatible with every Chanalyzer software variant, Wi-Spy DBx is the premier tool for Wi-Fi spectrum analysis. Designed for enterprise environments managing multiple 802.11a/b/g/n networks, Wi-Spy DBx is the tool of choice for IT professionals that require rapid identification and troubleshooting of wireless network issues. MetaGeek?s Chanalyzer software displays Wi-Spy DBx data in multiple graphical formats for quick and easy analysis, and users can seamlessly move between wireless frequency ranges. Advanced hardware control lets users quickly zoom-in for granular detail. 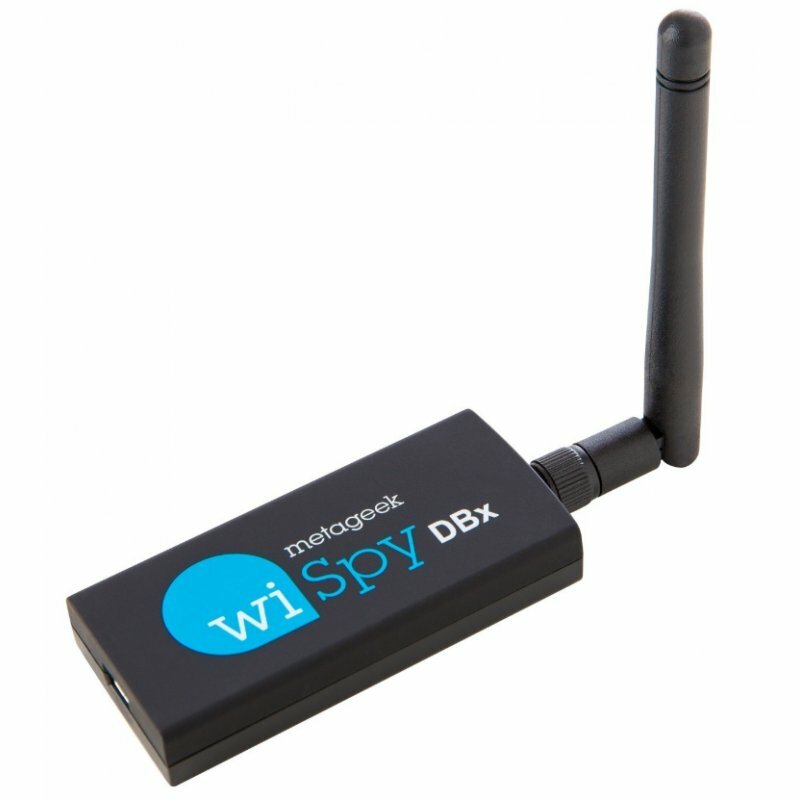 Wi-Spy DBx is the one tool that IT staff need to efficiently install, analyze, troubleshoot and optimize 2.4 and 5 GHz networks the MetaGeek way ? with ease. Wi-Spy DBx is the flagship hardware product of the Wi-Spy lineup, and MetaGeek?s most versatile and powerful spectrum analyzer tool. Compatible with every Chanalyzer software variant, Wi-Spy DBx is the premier tool for Wi-Fi spectrum analysis. Designed for enterprise environments managing multiple 802.11a/b/g/n networks, Wi-Spy DBx is the tool of choice for IT professionals that require rapid identification and troubleshooting of wireless network issues. MetaGeek?s Chanalyzer software displays Wi-Spy DBx data in multiple graphical formats for quick and easy analysis, and users can seamlessly move between wireless frequency ranges. Advanced hardware control lets users quickly zoom-in for granular detail. Wi-Spy DBx is the one tool that IT staff need to efficiently install, analyze, troubleshoot and optimize 2.4 and 5 GHz networks the MetaGeek way ? with ease. Density View displays raw spectrum data by frequency and amplitude point over a user-defined timeframe. The brighter the color, the more RF activity present. Density View is great for catching transmitters over time, and for finding interference trends. The Waterfall View displays RF activity over a defined timeframe in a rolling ?waterfall.? The brighter, or more red the color, the noisier the frequency. The Waterfall View shows when interference occurred and it?s duration. The Planar View graphically displays the maximum, average and current RF activity on a Density graph. The Planar View is a staple of traditional spectrum analyzers, and is included in Chanalyzer Pro with user-defined colors for complete customization. The Wi-Fi Channels Table plots average, current and maximum values, as well as the Noise Floor reading and number of placed Access Points to calculate a ?grade? for each Wi-Fi or ZigBee channel. Using the wireless NIC in the computer, Chanalyzer Pro collects Wi-Fi data such as SSID, RSSI and channel of networks in the area. Data is overlaid on a Density View to provide a correlation between known Wi-Fi sources and everything else (non-Wi-Fi) transmitting in the band. Every graph in Chanalyzer Pro automatically adjusts itself to the user-selected timeframe to provide a Unified Time Segment for quick and easy spectrum analysis. This functionality lets the user quickly drill-down to specific problems without reinitializing views. Users can choose custom colors to represent current, average and maximum, as well as overlays. This feature provides easy customization of graphs so MetaGeek users can visualize spectrum data in a format that works for them. Transmitter silhouettes are displayed to give reference to common interferers. Signature shapes can be hovered over the density view for matching. An industry first, Custom Classifiers let users define custom signatures for known Wi-Fi-transmitting devices in their space. Easily capture the RF silhouette by selecting it in the Density View, then save the Custom Classifier to quickly identify the device in future scans. Chanalyzer lets users easily configure Wi-Spy DBx hardware to zoom-in on narrow swaths of the spectrum for detailed, high-resolution viewing of specific frequencies. This functionality is ideal for deciphering strange signals, tracking down devices and closely monitoring single channels.